Join us for a private tour of East West Trees. East West grows wide array of palms (50+ species) at all stages of propagation, from seed beds and cutting liners to in-ground and 96-inch boxed trees; tons of succulents and proteaceous plants and staple subtropicals like strelitzia and bambusa; select perennials, trees, shrubs, and bromeliads. 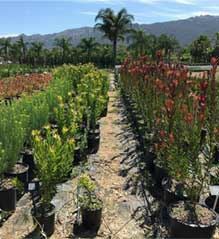 The nursery is set in the bucolic Rainbow Valley in a bowl of chaparral-covered granite hills. You will have the opportunity to select plants for purchase during the tour and pick up and pay for plants at the end of the tour. Our tour guides are our July meeting speaker, Jason Dewees, and the nursery owner and the nursery manager. The event is limited to the first 60 people to register. All tours start 9:10/ Select a group when registering so we’ll be able to divide into three groups of 20. 10:25 - 10:45, check-out for shoppers, refill water bottles, bathroom break. 11:45 - 12pm, check-out, refill water, bathroom break. By attending you agree to waive all claims against SDHS and any entities associated with the visiting the nursery or related to participation and travel to and from the nursery. No pets or strollers are allowed. The nursery is not handicapped accessible. Dress for dusty/muddy (some puddles due to irrigation) and uneven surfaces -- there's no paving in the yards, lots of equipment on the ground, and it's important that people wear closed shoes like hiking boots that they would wear for a day hike with puddles. There is very little shade or shelter apart from the bigger plants (mostly palm trees), so be prepared for roasting sunshine, hot, stuffy shade houses, and take a full water bottle. People will be able to refill their water bottles there. Toilets are limited to port-a-potties. Carpooling is recommended, as they don't have room for 60 cars. Probably 25 - 30 max.